In sitting, it is important that we maintain the natural curves of the spine, as shown below. Adjust the seat height so that your feet are flat on the floor or on a foot rest. Your knees should be parallel to, or slightly lower than, your hips. Push your hips as far back as you can in the chair. Your lumbar spine should be fully supported by the back of the chair, maintaining your lumbar lordosis (the slight natural curve of your low back.) If you do not have a built-in lumbar support in your office chair, a cushion may be used to support your lumbar spine. Shoulders are relaxed with elbows close to the body. Arms and wrists are parallel to the floor, with the elbows bent between 90 and 120 degrees. Adjust the arm rests if needed. Keyboards, phones and other equipment should all be within easy reach. Keep your neck and head in a neutral position on your shoulders. 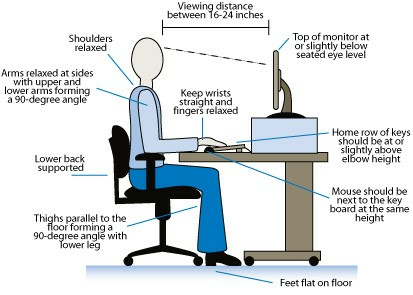 Computer screen should be at eye level to avoid sustained neck flexion positions. Prolonged static posture increases stress on the musculoskeletal system, overstretching spinal ligaments and placing strain on intervertebral discs. It is important that you take regular short breaks (one or two minutes) to stand and move around every 30 minutes. Even minimal movement will help. Where possible, change task every hour or take a phone call standing up. Stand and extend your lumbar spine, walk around your desk, do some simple stretches and change position to avoid sustaining the same position for the entire day.